High-volume, case picking is a labor intensive, and therefore a costly operation. Mallard floor-level pallet flow equipped with the Flex Separator (FS 200) will shave minutes per pallet, plus improve worker safety, and avert inventory damage to add positive results to your bottom-line. 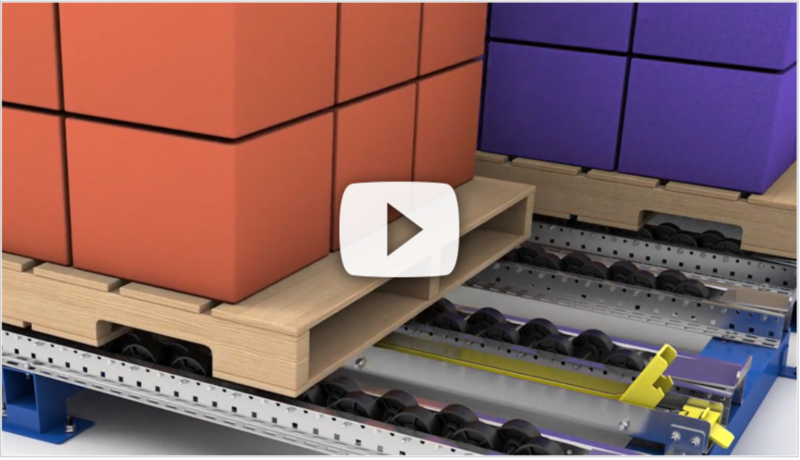 As seen in our 3D animated video, floor-mounted pallet flow provides ready reserve pallets for a more efficient picking operation, but what makes this design so effective is the addition of the Flex Separator mounted directly into the flow lane. The Flex Separator holds the rear pallets back 4”- 6” behind the front pallet, essentially isolating that pallet. How does 4” to 6” make such a difference? That small separation between the front pallet and the rear pallets, removes the back pressure of the rear pallets that would otherwise rest upon the front. It also eliminates the danger of rear pallet hanging up on front pallet. The front pallet can be quickly and easily removed when it is emptied without fear of worker injury or reserve inventory damage. Why is removing back pressure important? Back pressure = .06 x 2,500 lbs. x 4 pallets = 600 lbs. Back pressure = .06 x 2,500 lbs. x 19 pallets = 2,850 lbs. Add 600 lbs. or more of pressure to pallet after pallet and that becomes one very long and eventually injury prone day. 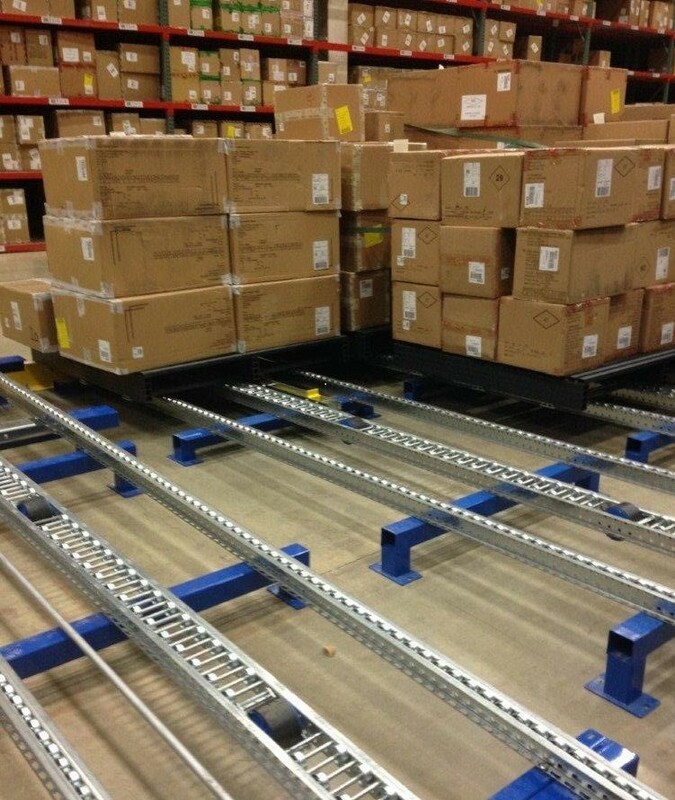 However, with the Flex Separator, once the isolated empty pallet is easily removed, the worker simply presses a foot-operated release button to allow the rear pallets to index forward in a controlled manner and start the process over again. Depending on your lane design, Mallard also offers several pallet flow accessories that can further improve the function and longevity of your system. Speed Controllers – drop-in or indirect-mount, these braking devices slow advancing pallets and maintain a controlled, even pallet tracking down the lane. Entry Guides – mounted left and right of the charge end of the system assist forklift drivers in centering pallets for quicker, trouble-free pallet loading. 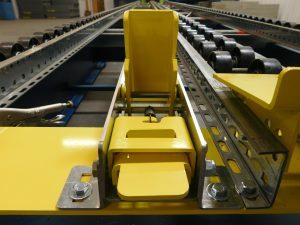 Ramp Stops – bolt-on accessory gently slows pallet to a stop at the discharge end, or pick face, and helps hold pallet securely in the lane. Download our Pallet Separator Brochure to learn more about the Flex Separator and to see the complete line of customized pallet flow lane separators available from Mallard. Call the Mallard team for design ideas and to schedule an in-house pallet flow test to see for yourself the difference that a customized floor-level pallet flow lane with the Flex Separator can make for your picking operation.